Dosage and Use: Take one capsule upon waking and one capsule before midday meal, preferably on an empty stomach, or as recommended by a healthcare practitioner. Caution: Those with hormone related cancers such as prostate cancer or breast cancer should not use DHEA. 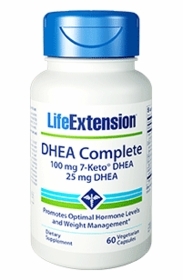 DHEA serum blood tests are suggested 3 to 6 weeks after initiating DHEA supplementation to optimize individual needs.